Unfortunately, the Acederm Wound Ointment and Spray is not available for sale anymore. Please have a look at our entire medicines and supplements range for alternatives. The ointment heals abrasions and superficial wounds while removing dead tissue. Acederm ointment keeps the wound smooth and promotes the formation of new skin tissue. Acederm keeps scars to a minimum. Acederm wound spray and ointment contain allantoin, cod liver oil and peru balsam as active substances. By combining these substances, the moisture content in the stratum corneum is increased and the subsequent formation of new skin tissue is normalised. The Acederm ointment should be applied to the wound twice a day after cleaning the wound surface. If desired, the wound can be covered with a bandage after the wound ointment is applied. The wound ointment may also be applied to old scar tissue. 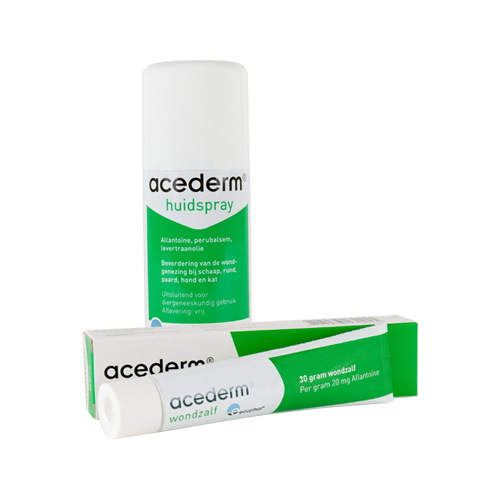 Acederm wound spray must be applied to the wound twice a day after cleaning of the wound surface. If desired, the wound can be covered with a bandage after the wound spray is applied. The wound spray can also be applied to old scar tissue. Have you used Acederm Wound Ointment and Spray before? Let us know what you think about this product.